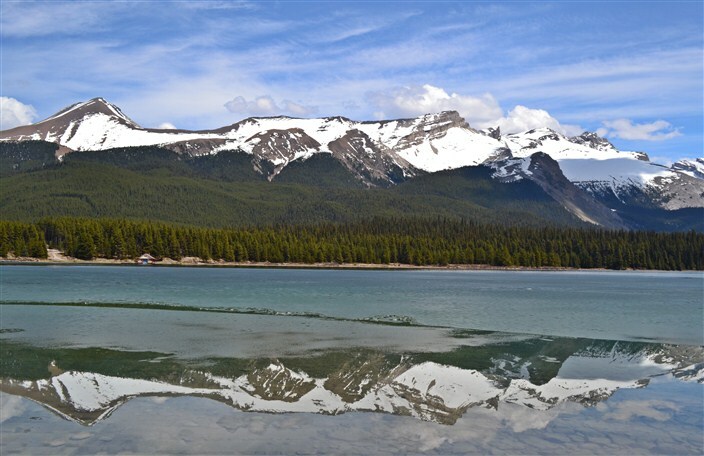 Jasper National Park is situated immediately to the north of Banff National Park in Alberta. The two are basically conjoined twins, one gigantic park with no natural boundary separating them, nor much of any other way to tell them apart. 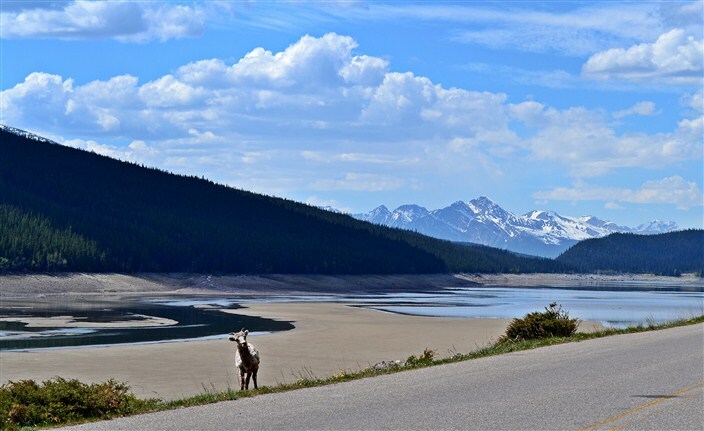 For us, it was simply a matter of passing through a ranger station and continuing on our way driving north along the Icefields Parkway. 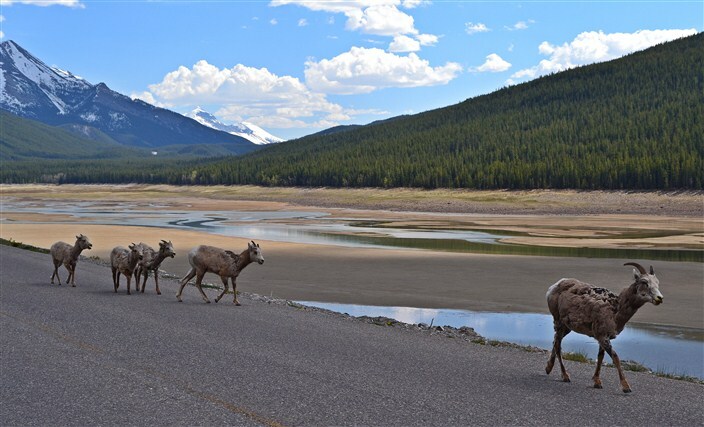 Jasper National Park, by contrast, is more geographically isolated from large urban population centers. It’s about a three hour drive west of Edmonton, the closest big city, and receives approximately two million visitors annually. Granted, this is still a lot of people, but it simply feels a lot less crowded than Banff. 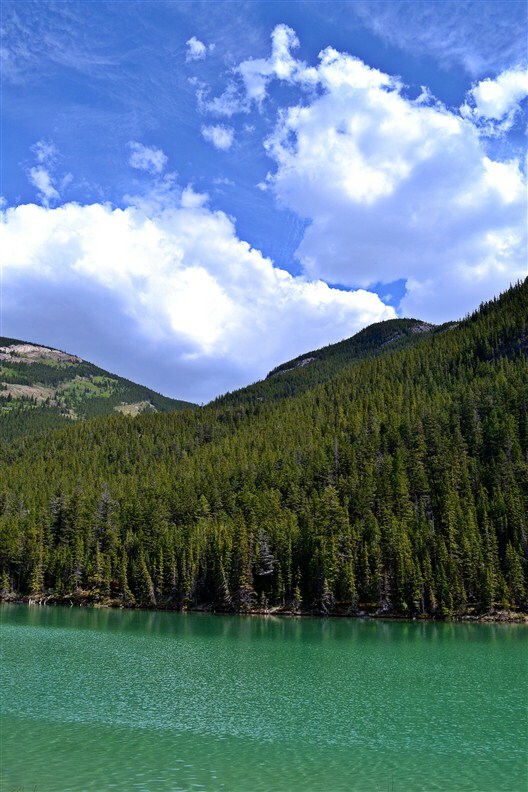 The park was established on September 14, 1907 as Jasper Forest Park, and was granted national park status in 1930. 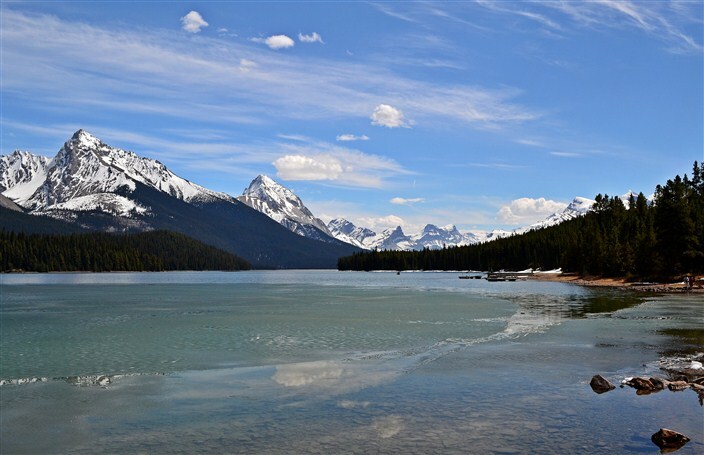 Jasper N. P. is the largest national park in the Canadian Rockies, spanning 4,200 sq mi. 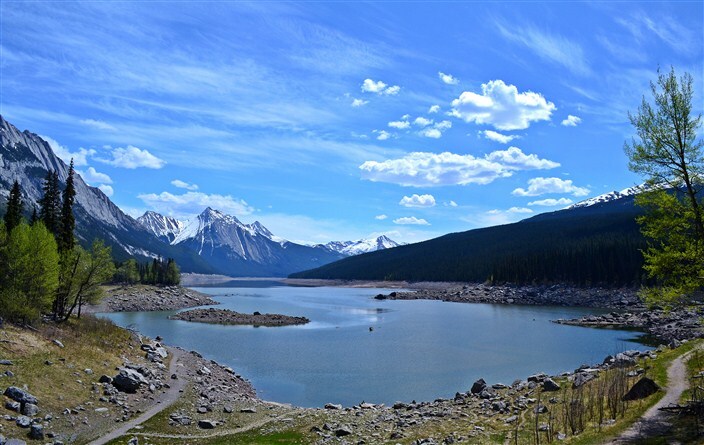 In much the same way as the two parks have their similarities and differences, so too does the town of Jasper both contrast and compare to the town of Banff. Jasper is smaller, quieter, less chic, more rugged. Frankly, I prefer Jasper. 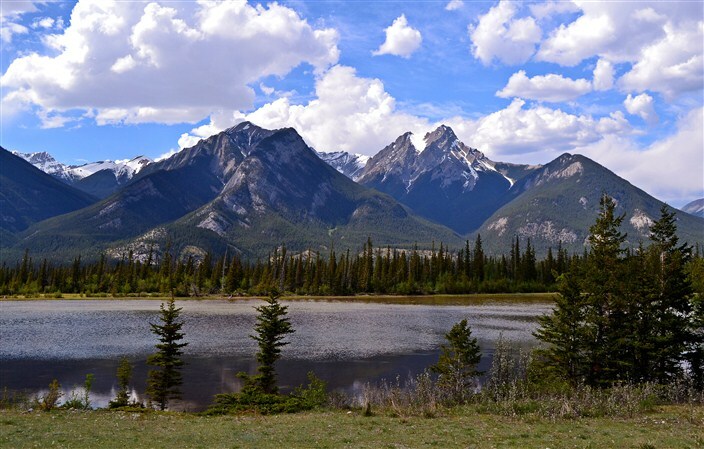 It has an authentic small town charm and vibe that I found missing in Banff. Sure, Jasper has its share of tacky tourist shops but not nearly the so many as Banff does, and they are confined to basically one side of a three-block stretch of the main road through town. Prices for most things such as restaurants, hotels, etc are also a little wallet-friendlier in Jasper. 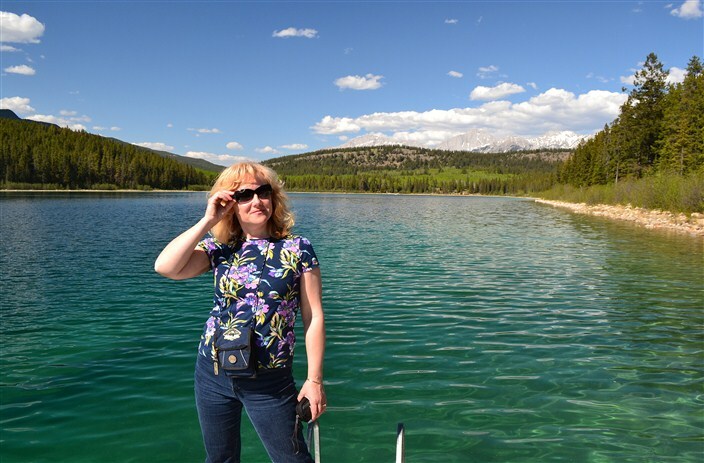 And here I want to give a short, shameless plug for our accommodations, the Patricia Lake Bungalows. Located just a few miles outside of Jasper, it’s a wonderful place to stay if you don’t require being right in town. 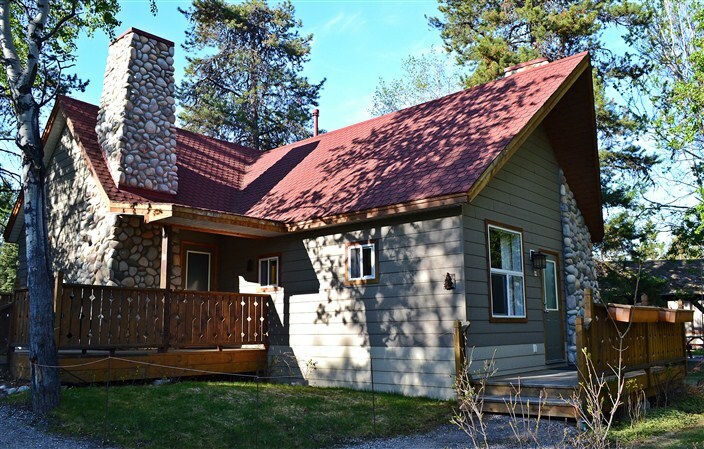 Clean, spacious, affordable, very friendly and best of all, situated right on the shores of beautiful Patricia Lake. They have a nice dock for swimming, as well as canoes, kayaks and rowboats available to rent for a small fee. And no, they aren’t paying me anything to say all this. We just had a great stay and I wanted to pass it along to anyone who might read this and wants to know where to stay in Jasper. We wished we could take the place with us for the rest of the trip when we left. 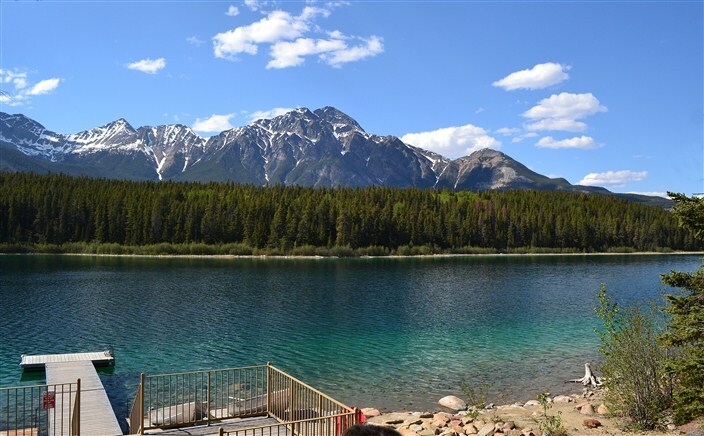 As with Banff, there are a myriad of outdoor-oriented activities to occupy you when using the town of Jasper as a base. It would almost be easier to list the things not available for your outdoor vacation pleasure than to enumerate them all. Basically, whether you want to do it on foot, horseback, bicycle, tramway or water, you will find it available here. Oh, and let’s not forget rail. 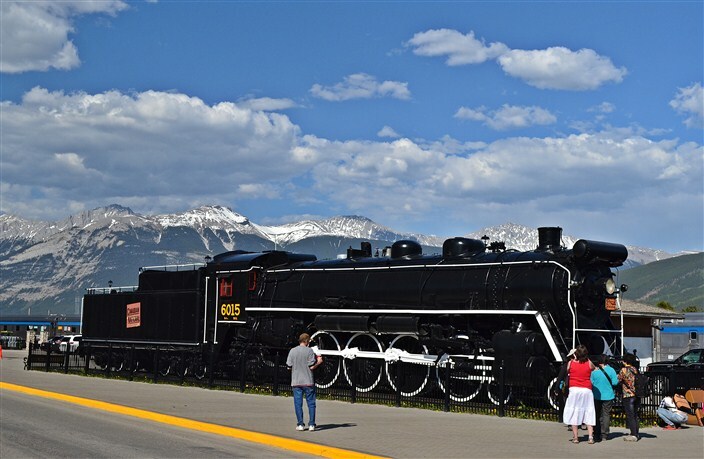 The Canadian Pacific Mountaineer rolls through and stops in Jasper regularly. For our part we stuck to foot travel. 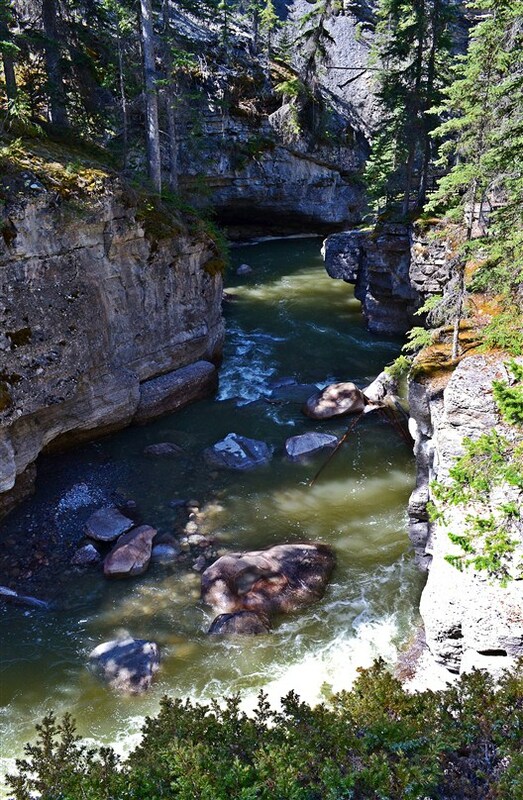 We headed south from town to explore the Maligne River Canyon, a marvelous box canyon over a hundred feet deep in places, cut by the Maligne River through the eons before it flows into the Athabasca River. 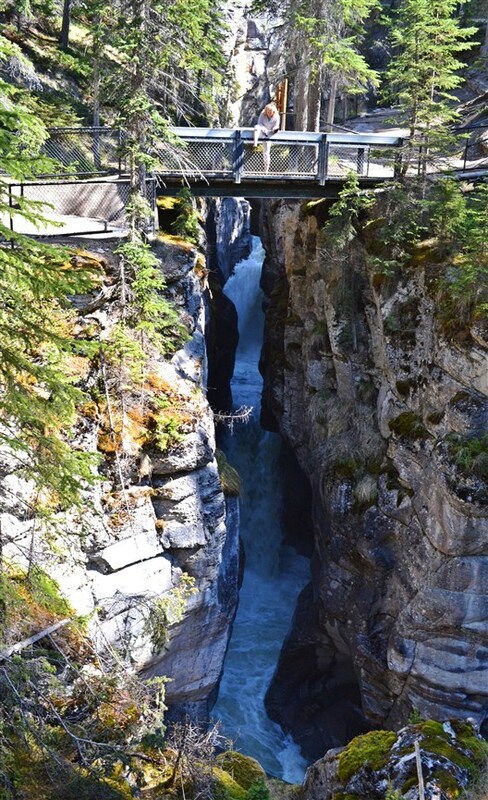 A series of bridges cross and recross the canyon as the hiking trail parallels the Maligne River, affording plentiful scenic views and photo opportunities. 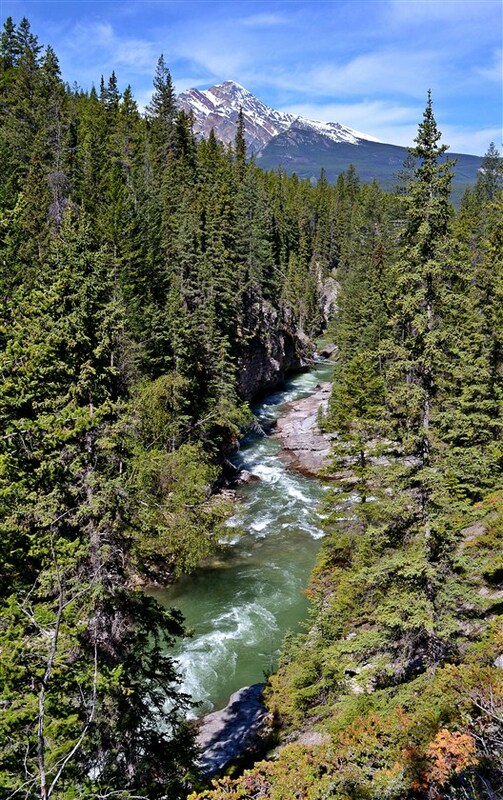 It’s neither a wide nor deep river, but the Maligne’s fast-flowing and crystal clear waters would easily sweep you away at most points along the section we hiked. The trail can be accessed from several points. If you plan on seeing the whole thing and retracing your steps to where you parked, your best bet would be to start downstream at the sixth bridge and hike it uphill to start. That way you’re heading downhill on the way back when you’re already tired. There are some steep stretches along the way. Of course if you have the option of someone picking you up at a different point from where you started, I’d suggest starting at the top near the first bridge and hike it downhill. Either way it’s a great trail you won’t want to miss. 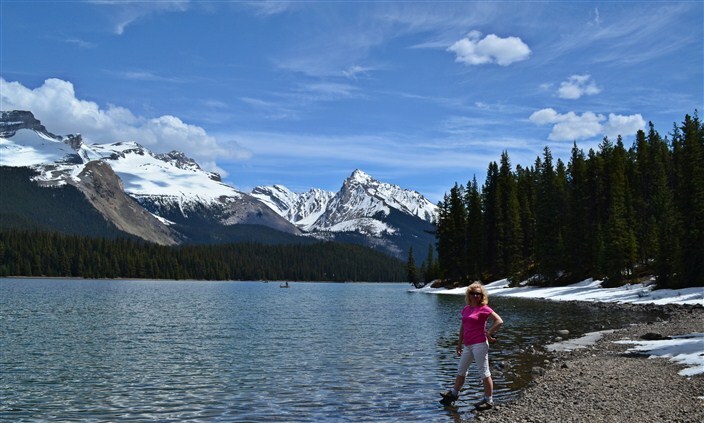 After we finished hiking the canyon we drove further south past Medicine Lake and on to magnificent Maligne Lake. The highlight here is taking the boat ride out to Spirit Island. Unfortunately we were unable to do so as it was too early in the season and the boat tour was not yet operating due to large amounts of ice still floating around in the lake. We had to content ourselves with picture taking and hiking along the lakeshore instead. Not a bad consolation prize, though. 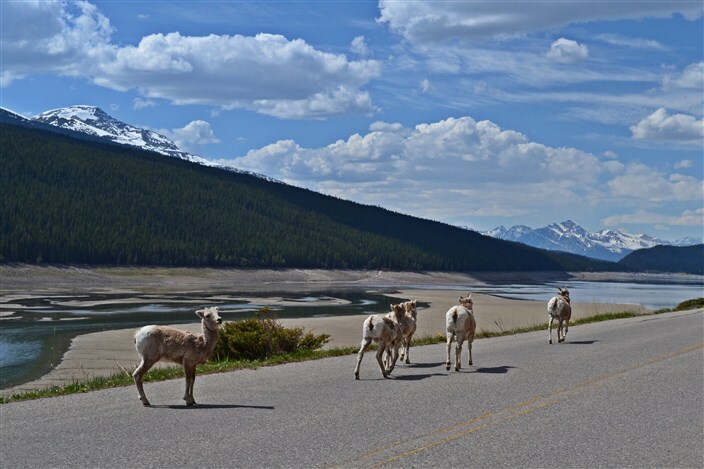 When we left the Maligne Lake area and headed back, we were treated to the accompaniment of a family of goats racing alongside our car as we passed Medicine Lake. 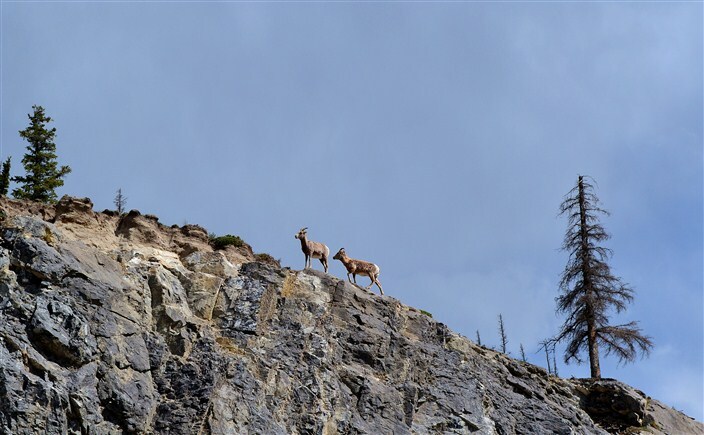 At first just one of the goats popped its head over the edge where the road dropped off toward the lake. We pulled over to watch, and after a couple of minutes our patience was rewarded as a female and her four kids came up on the road and began walking the same direction we were headed. We paced them with the car (luckily this was a very sparsely traveled road). Soon they picked up speed to a canter and we matched them again. They increased to a flat-out run and we continued alongside them for several minutes at a speed of between 25 and 30 mph. This went on for some time until suddenly on the other, uphill side of the road a male goat burst out of the trees and galloped along the hillside about forty feet above us, also going the same direction. The hillside was composed primarily of loose dirt and rock and as he ran he sent a shower of debris cascading down the steep hill toward the road. We decided the mother and her brood were trying to hook up with him and we were probably preventing it by placing our car between them. Eventually they stopped and we figured it was best to move along and leave them alone. It was our best wildlife encounter of the entire trip. After that it was, unfortunately, time to call it a day and head east, leaving Jasper National Park behind, knowing we’d only scratched the surface of what it has to offer, but looking forward to another encounter with its wonders in the future.